Display tablets have been in the industry for many years. But, they were so expensive that it was very difficult for the artists to get their hands on them. Beginners had no choice but to settle for less. It was a matter of time that the tablet manufacturers started making inexpensive display tablets with all the features you need. 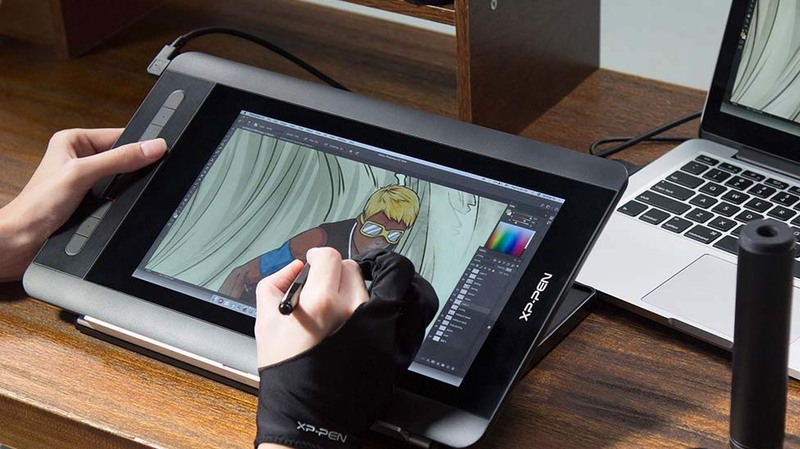 This brings us to Xp Pen Artist 12, which is the cheapest display tablets in the market. In this Xp Pen Artist 12 review, we would try to find out what makes this device so affordable. We would also try to figure out whether they have compromised on quality for keeping the price low. Then we will compare it with other tablets in the market. In the end, we would give you the answer which you have come here for and that is “whether you should buy this or not”. Xp Pen Artist 12 is one of the cheapest display tablets in the market. With cheap tablets like these, one does not expect much. 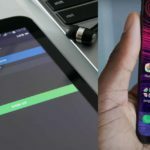 We were also skeptical as to – how would a 200-300 dollar device compare to other tablets in the market when they are twice, thrice or even four times the price of this one. Most of the beginners would not spend 1000 dollars on Cintiques and want something affordable. We were curious as to how would a cheap tablet as this would perform. With all our skepticism we finally ordered the Xp-Pen artist 12 on Amazon and it showed up a week later. Xp Pen Artist 12 comes in a nicely build professional looking white box. First thing you find opening the box is the tablet itself. It is neatly wrapped in plastic. Putting it aside you will see another box with all the paperwork, drawing glove and a microfiber cleaning cloth. Next, you will find the charging adapter with a USB inlet. You will also find three international wall plugs, which could be great if you constantly fly to other regions. There is a pen holder neatly placed in the right-hand compartment. And finally, in the last box you will find all the cables you need. The tablet comes with a hybrid cable which minimizes wires on your desk. On one end of the wire, you get two USB and an HDMI plug. One of the USB plugs connects to the power adaptor and the other two (USB+HDMI) connects to the computer. If your computer has a powered USB port you can connect the third connector to the computer itself instead of the power adaptor. The other end has a single USB type-c connector which connects to the display tablet. It is L-shaped and can connect in an up or down position. If your laptop does not have an HDMI port or a full-size USB port. You need to get an adapter, Yeah! Welcome to dongle life. We recommend using Kingston Nucleum for this which has all the ports you will need including the powered USB inlet. The other cables include a USB extension cord and the last cable is HDMI to mini display cord. 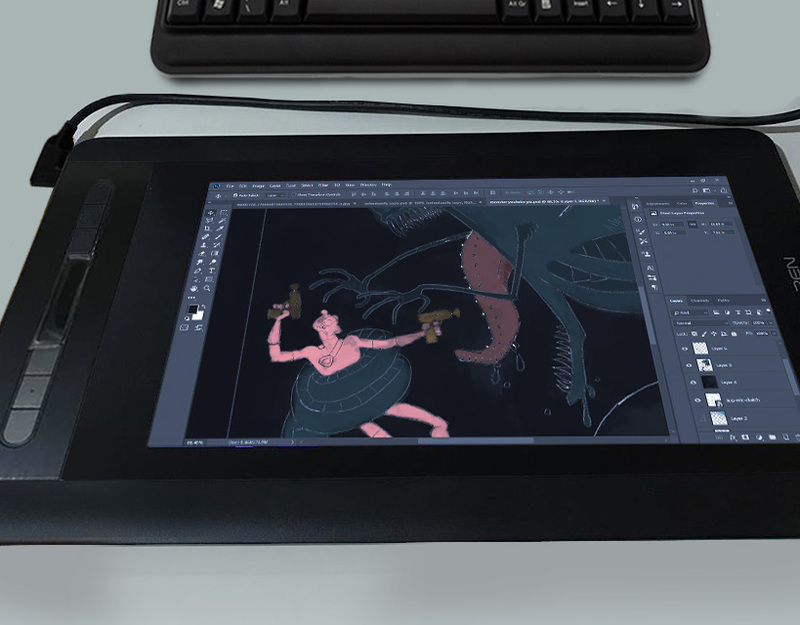 Overall you get possibly everything you need to get started with drawing on your display tablet. Shifting our focus to the tablet, the device comes with a plastic protective film on the screen. Removing it you will notice the anti-reflective coating to reduce glare which also works as a textured surface. The Artist 12 is a fairly compact tablet, in spite of having a screen inside, it is very slim. The buttons are well placed and easy to reach. All the buttons align on the left side with the drawing area on the right. One of the best things about this design is, when you are drawing with your right hand, the button area works as a resting place for your left hand. And as the buttons are already present their it is much easier to use and avoids unnecessary hand movements. The back of the device is quite plain with nothing but four circular rubber pads. On the left edge, you get a USB-c port, a power button and the plus and minus buttons for adjusting the brightness and contrast. This one is a bit tricky. While in concept a touch bar is a great idea. It allows you to zoom, change brush size and scroll. The placement and implementation are also great as it is positioned in-between shortcut keys. The only matter of concern is that it does not works well, at least not as good as it should be. We had to swipe a lot for just a little scroll and small change in brush sizes. A display is one of the most important parts of the display tablet. It is very important to have a bright and color accurate display, especially in the creative field. A lot of times when you work on the cheap monitors or older laptops, they represent color differently and when you see your work in another display the colors differ. 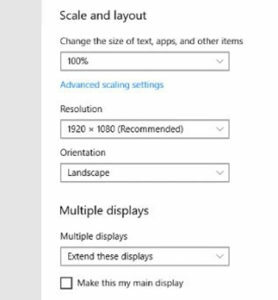 Many people use monitor calibrators for correcting their display but they could be very expensive. So, it becomes very important that the display tablet has a color accurate display. 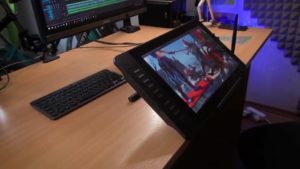 The Xp Pen Artist 12 has a 1920 x 1080p HD display. Almost all display tablets comes with a 1080 p resolution display, but due to its small size the Artist 12 display looks very sharp. It covers a 72% NTSC (National Television Standards Committee) color gamut which is very similar to Adobe RGB. It means the display is capable to show a lot more colors than the normal RGB monitors. The viewing angles are great and the tablet was able to maintain its color on steep angles without distortions. 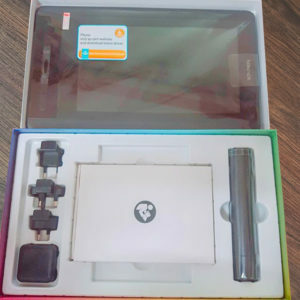 The screen is bright and vibrant and combined with its sharpness you would be pleasantly surprised with what you are getting at this cheap price. 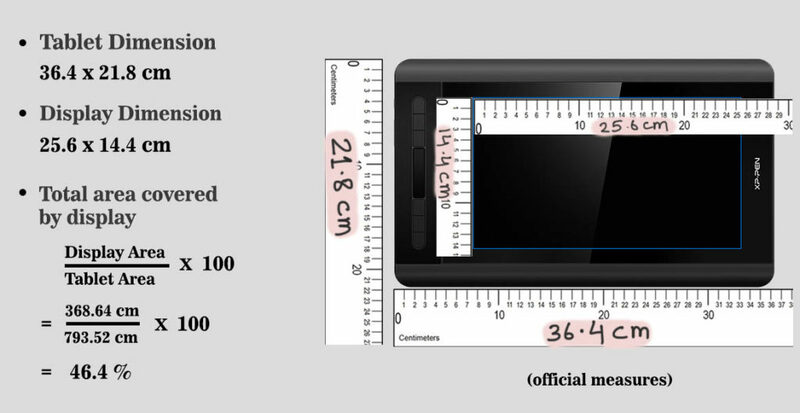 Although it says Artist 12 which implies the screen is 12-inches long but the actual screen is 11.6 inches diagonally. This is the smallest workable screen you can draw on. Coming from a 15-inch and 21-inch screens it felt small. After working a few hours you are likely to get used to its size, that is what happened to us. We would give it a 6/10 in terms of portability. In theory, a 12-inch display tablet should be super portable, which is kind of true in the case of xp-pen Artist 12. The tablet can fit into a laptop bag and can be easily transported to your workplace as well as home. But what we actually want to point out is the bezels. The Artist 12 have got massive bezels all around. 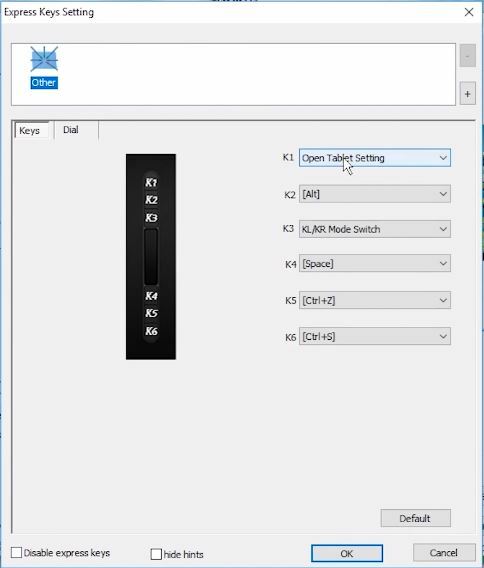 There is no official number as to what percentage of the tablet is covered with the screen. So, we tried to find out using the maths. The image on top shows the mathematical way of finding that. From the image, it is clear that the display covers less than half (46.4 %) the total area. Which is really bad, especially when we compare it with smartphones which have 80 to 90 percent of the area under the display. To be honest, all the display tablets and drawing tablets have the same issue and there is no better alternative even at the higher price range. 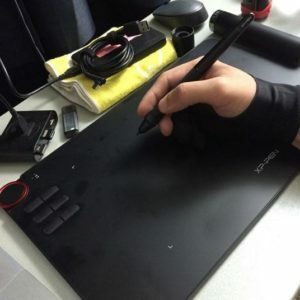 It does not affect the drawing experience but makes the physical size of the tablet bigger. In the case of drawing tablets, some artists prefer to have some extra space around the screen. 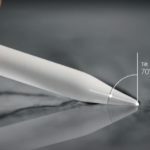 It has been said again and again that the overall performance of the drawing tablet is greatly affected by the stylus. A good stylus can add to a better drawing experience whereas a bad pen can really mess that up. Broadly speaking, display tablet usually has some issue with the stylus. 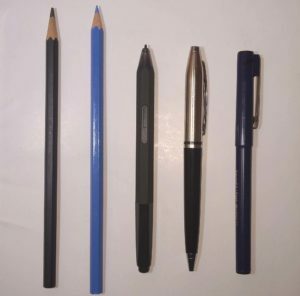 Other than Wacom there are only a few brands who have been able to come up with a good stylus, Xp-Pen is one of them. The Artist 12 uses the Passive stylus which does not need batteries. It works on EMR (electromagnetic resonance). The main advantage of the passive stylus is they are maintenance free as you don’t need to charge them, ever. They are less prone to accidental damage than their battery-powered counterparts. Xp Pen comes with their newly designed Stylus with 8192 levels of pressure sensitivity. The physical length, width and weight of the stylus are near perfect. The pen comes with a hexagonal side and kind of mimics the feel of the pencil. The stylus is comfortable to hold for a longer duration of time. It has a single button at the side which sits flush to the surface to avoid false presses. But it takes a little getting used to. There were also times when we found it difficult to find without looking. There is an eraser at the back which is compatible with most of the drawing software. The pen has a two-step texture on its surface. The bottom half of the pen has a soft textured material which feels nice to hold. The back end (near eraser) has a glossy plastic finish. One weird thing about the Matte texture on the pen is. If you are someone who has the peculiar habit of holding your pen in the mouth you better not do that with this one. It leaves a bad taste in the mouse, especially when it is brand new but this effect fades up with time. Overall it is well built and does not feel cheap. The Artist 12 pen performs really good in terms of practical uses. In slow line test, the lines are straight and perfect. We tested it with a ruler and the results are good as they should be. The pressure range is also on point and we found no weird pressure bumps. The ends of the strokes have no bend and bumps and everything seems to work perfectly. In many old model display tablets, you would notice there is some distance between the pen and the strokes being drawn. In some cases, the situation is worse around the corner edges of the screen. Parallax happens when there is some gap between the actual display and the glass top on which you are drawing. With time the situation has improved and now there are a number of tablets in the market who does not suffer from parallax issues. Xp-Pen Artist 12 is one of those tablets and does not have parallax or lag of any kind. Xp Pen Artist 12 comes with a cylindrical pen holder. Many of the display tablets do not come with any kind of pen holder so it was great to see in a budget tablet. The Physical built and sturdiness of the pen holder is nice. Pen has a plastic construction with rubber pads on top and bottom. The cylindrical side panel is coated with a soft touch material which feels good in the hand. Overall it provides great protection to the pen and feels like an expensive accessory which gives your setup a professional look. 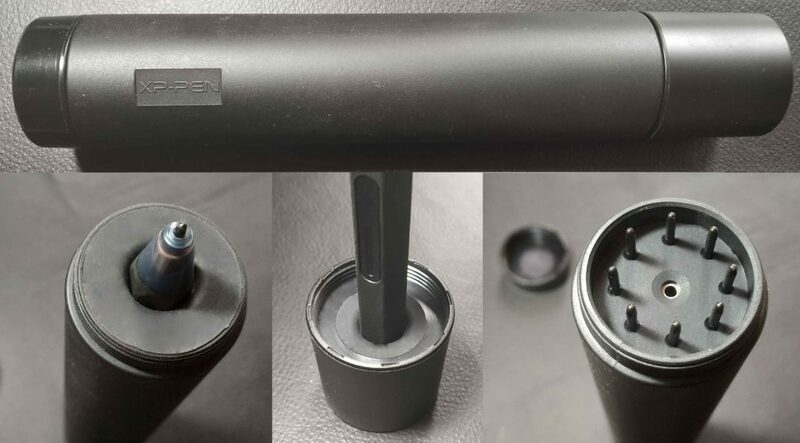 Opening the top compartment you will find the pen tugged inside the cylinder. The top cap then turns into a pen stand which holds the pen in an upright position. The pen stand/cap is bottom heavy as the rubber pad at the base also helps in the balance. Overall it does a good job of holding the pen and also looks good visually. The bottom end of the pen holder acts as a storage compartment for the pen accessories. The base opens up to reveal 8 extra pen-tips which placed neatly in their padded compartment. The center of the pen-tip holder has a nib remover tool. It helps in removing the nib out of the pen. The nib remover tool has no physical barrier between the nib storage compartment and pen storage. So sometimes when you remove the nib it gets sucked into the pen chamber and comes out of the other end – just to let you know. Careful, don’t lose your nibs. The Xp Pen Artist 12 connects to your computer with a set of different wires. It needs to transfer pen data, display data along with the power input in order to work. So the tablet has a set of three wires (two USB and an HDMI) which connects to the computer. Everyone wants a clean desk, wires look messy and have to risk of getting damaged very easily. They also restrict your movements and in this particular case defeats the purpose of getting a small and portable device. Xp Pen has implemented a genius design which solves all these issues. They have put together all the three wires into one single cable. The cable then connects to the tablet via USB-c port. At the end what you get is a single wire coming out of your tablet instead of three. It comes with two additional wires namely – a USB extension cord and an HDMI to mini display port for Mac computers. If your computer does not has a powered USB outlet than you can use the USB extension cable to connect it to the power adapter. Go to Xp Pen download section and download driver for Artist 12. Your computer does not necessarily understand pen and pressure data. A driver is a software which helps your computer to communicate with the display tablet. It also enables you to change settings, assign shortcuts to buttons and change pen pressure sensitivity to your personal taste. The main window of the Xp Pen Artist 12 driver allows you to change the pen buttons as well as change the pressure and stiffness of the pen with the help of the graph on the left. The driver also allows you to calibrate your display, change the display color settings and edit expresskeys to the shortcut of your choice. Another window will open up with buttons from k1 to k6. You can select your custom shortcut by pressing the given buttons. 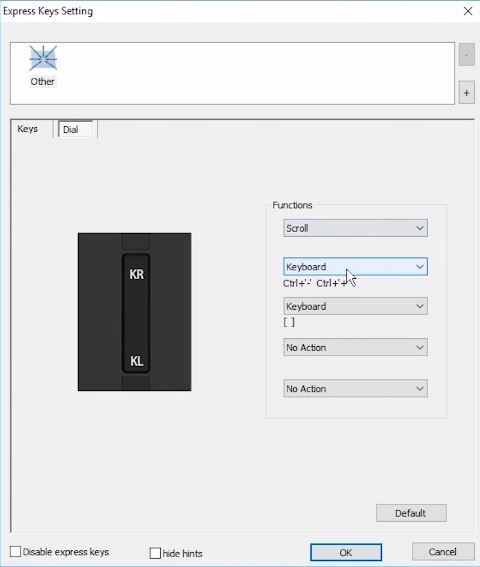 The driver also allows you to put application specific shortcuts. You can do this by clicking the plus(+) button on the top right corner which will open the dialog box where you can select any drawing/ modeling application. This also works when you are working on two applications simultaneously. Once you switch to another application the driver automatically changes the shortcut buttons for that application. Similarly, you can also change the settings for the touch bar by clicking on the dial button on the top left corner. You can assign a total of five shortcuts to it. For those who are left-handed, the driver has a button which lets you rotate your screen by 180 degrees so that you can work comfortably without any limitations. 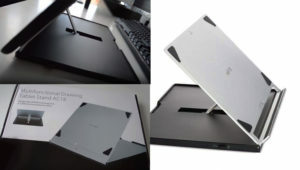 Artist 12 does not come with a tablet stand but xp pen has an official stand which they recommend using with this tablet. The aluminum made stand feels strong and does not collapse on heavy load. I really loved its slim profile when unfolded. It makes it easier to carry along with my tablet. What I liked the most about this stand is its adjustability. The stand can be set from 0° to 65° with an increment of 1°. Which is a very comfortable range for drawing on the screen. 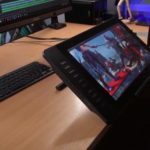 There are other alternatives to this stand but some of them are way too expensive for the simple task of keeping your tablet upright. Most of the cheaper stands are of plastic and fall down/break on heavy load. Everything gets hot whether be the mobile phone or the computer itself. We may ignore this factor in other devices. But in display tablets when it gets hot it becomes quite uncomfortable to draw on. Some of the tablets have good heat dissipation but in other tablets, heat zones get created. Heat zones are the part of the tablet screen which gets very hot. The Artist 12 does not get heated on mild use but from what I have experienced is after four to five hours of continuous use it slowly heats up and you can feel it. But the heat remains low and does not feel overwhelming and you can continue your work. Here comes the final question, should you buy it? The first reason to buy this tablet is that you will not get this value for the price you are paying, anywhere. In spite of being extremely cheap the tablet works perfectly, to cut the cost they may have reduced the size of the screen but they have not reduced the functionality. Everything works perfectly be it the software, the shortcut buttons or the pen itself. Cheap tablets suffer the most in terms of the display quality but that is not the case here. The color accuracy, contrast and brightness are at the level you will find in much higher range display tablets. The 1080p display on a small screen makes it sharper than most other displays tablets. Display tablets are not portable. The12-inch display and fairly small form factor makes it the most portable display tablet. The cleaver wire minimizing design also helps in this. Why you should not buy it? If you are not a fan of a small screen than this tablet will not suit your taste. Although we also had the same skepticism before trying it out, but after a while everyone got adjusted and did not seem to mind it. 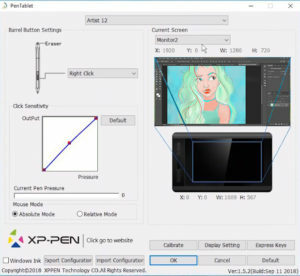 If you are looking for a bigger screen with same features you can check out Xp Pen Artist 13.3 or the Xp Pen Artist 15.6. But with a bigger screen, it is obvious that you will have to spend a little extra. 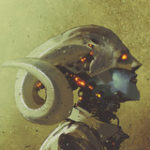 3DFx Studios is the offline learning platform for young VFX artists. Our courses include 3D animation, Sculpting and special effects. Xp Pen Deco 03 Drawing Tablet Review – Best Budget Tablet for Beginners?